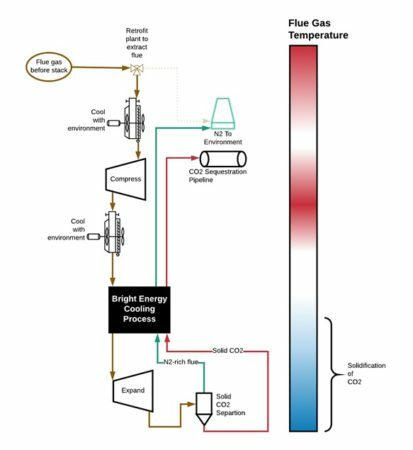 Bright Energy is a startup company near Denver, Colorado, USA working a novel carbon capture system which they think can achieve $15/tonne for a coal-fired power plant (Figure 1)—with >95% capture of the flue gas CO2. 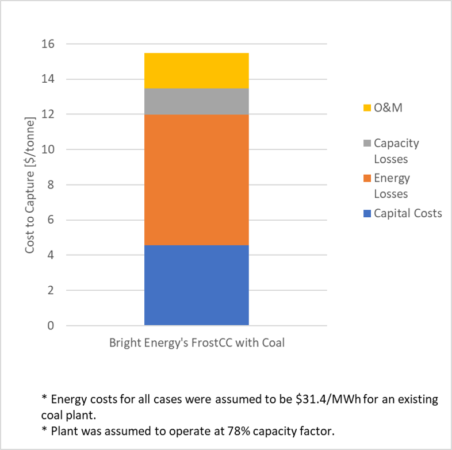 Bright Energy’s carbon capture system, called Frost Carbon Capture (FrostCC), came out of their interest in decarbonization, and their experience in thermal-power systems. The company has been developing innovative thermal energy storage and heat pumping augmentation for existing steam power plant assets in collaboration with the Electric Power Research Institute and several prominent power plant owners. That effort has clarified the crucial need to retrofit existing power assets to achieve radically lower costs–whether with energy storage or with carbon capture. The FrostCC process is shown below in Figure 2. The system is engineered to use heat-pumping technologies to chill the flue gas to the point where CO2 changes phase from vapor to solid (frosts). There are many ways to do this, but FrostCC works by compressing, cooling, then expanding the flue gas to create a refrigeration process with the flue gas itself. This is different than some other heat-pump carbon capture approaches, which use external refrigerants to cool the flue gas. One of the major benefits to using the flue gas as the only refrigerant is that it provides a more robust cooling process with inherent self-correction for varying flue gas species and other process variations that occur during plant operation. FrostCC has many advantages compared to other carbon capture technologies. First, it is easy to retrofit to existing power and industrial plants because the process only connects to the plant near the exhaust stack, while its energy input comes from electricity (vs. non-trivial thermal plant couplings in many CCS systems). Additionally, the FrostCC process design was optimized to minimize system capital costs while keeping efficiencies competitive. To do this, FrostCC engineers designed the system around long-standing heat exchangers and machinery architectures. The FrostCC design is modular and allows for factory manufacturing with minimal site design and installations costs. Low system capital cost has significant benefits in terms of development cost (and speed) and offers high returns on investment beneficial to getting early systems deployed. Lastly, FrostCC has a unique process strategy which lowers the energy penalty of its carbon capture to only 240 kWh/tonne for a conventional coal plant. Bright Energy is testing expander and heat exchanger subsystems now and expects an end-to-end system test (about 8 tonnes of CO2 per day) within 16 months. For those interested in business relationships or policy discussions regarding FrostCC, please contact Kevin Pykkonen at kevin@brightes.com.